The Mega Foods supermarket on Queen Avenue, shown Sunday afternoon, was closed a year ago. What exactly is the zoning issue that is making it hard to find a new tenant or buyer for the former Albany Mega Foods supermarket at 2000 Queen Ave. S.E.? I think I know the answer, but I didn’t get it from City Hall. Pam Rushing, the Coldwell Banker Commercial agent marketing the property, told me last week there were complications with the zoning, and they were trying to work it out with the city. Fine. I understand. I also don’t like to wait, so I looked at the site on the zoning map, and then read the zoning code. According to county tax records, the supermarket contains roughly 42,000 square feet of floor space. And whatever the zoning was when it was built in 1990, the zoning obviously allowed it. In short, a supermarket is no longer allowed in the very place where one operated for 27 years. 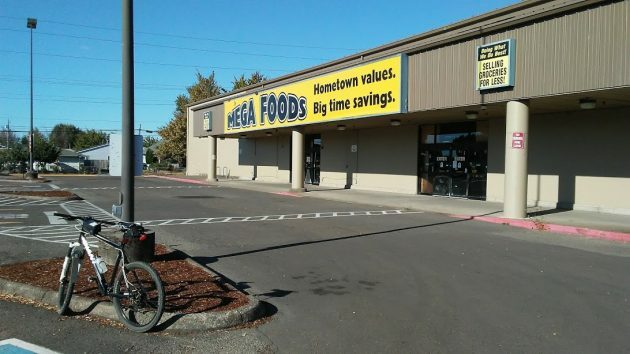 Since Mega Foods had to close in the face of increased competition, especially WinCo, starting a new one there would be a long shot anyway. I can’t remember when the zoning was changed, or why. The building (being used temporarily for equipment storage by Walmart, as reported last week) is within walking distance of several hundred apartments. I bet many of the households there miss having a full-service grocery around the corner. Again, though, even if they all shopped there every week, apparently it wasn’t enough for the market to stay open. As for the current zoning, it’s hard to justify. Another convenience store? In 42,000 square feet? With a 7-Eleven on the corner across Queen? Elsewhere in Albany, former supermarkets have been converted into gyms. Not sure there’s a demand for yet another exercise emporium, but even if there is, “neighborhood commercial” does not allow “indoor recreation.” So even that alternative seems to be out. It appears that if Albany’s government has its way; with zoning like this and the historical buildings (read crack house dumps) that aren’t allowed to be torn down it will soon be known as Detroit “west”. On a ride to Albany maybe ten years ago, I walked through it, probably even bought something, was unimpressed but don’t remember why. Maybe it would have done better if it really was a convenience store (forget “mega”). But then it should have been located right inside that (at least superficially) attractive apartment complex, maybe facing the bike path, instead of across a nasty street. Whoops, zoning again? Big smile of recognition here. I can’t afford to spend all night researching and composing an explanation. It’s complicated. Whoops again! One day I’ll learn to re-read the article, and look at aerial photos, before hitting “Post Comment” I forgot about the 7-Eleven – so much for “convenience store.” The apartments I meant are the Brookshore, to the northwest, failing to notice the many apartments all over the area. It ain’t seem right, that a property be overlaid by zoning regulations which force it into non-compliance. I mean, it doesn’t sound as if Mega Foods closed then City re-zoned the property, it sounds like this zoning was enacted in direct conflict with the existing operations at the time. Maybe I’m wrong, but it smells kinda lawsuity, like City just exposed itself to risk it coulda shoulda avoided. I also learned the hard way about the difference between CC and NC. There are many restrictions on NC property. No gas stations no drive thru McDonald’s etc. Welcome to the People’s Republic of Albany. Government imposed zoning laws/rules are a violation of private property rights. In a free society these laws/rules wouldn’t exist. There are plenty of voluntary ways for property owners to come together and determine the best use of privately owned land. We lose a bit of freedom every time a coercive government decrees, or a bureaucracy arbitrarily decides, what is the “best” for us. Give Shadle freedom, or give him the other way. Gordon, what do you think of Houston, where it’s all(?) covenants instead of zoning (that’s all I know about it)? Is that a better way? Or, does it just replace government tyranny with tyranny initiated by powerful private interests? I’ve heard some or much of the Hurricane-Harvey disaster in Houston being blamed on lack of zoning/regulations. Any insights? These are honest questions. Though I often (mostly?) disagree, I respect your opinions and your skill in presenting them, and wish that some of your detractors had more constructive responses. I don’t know how, in ideological terms, to get to a better physical environment. All I know is that much of the American landscape is, to put it very mildly, sub-optimal. Three corners of the Queen/Geary intersection are totally repulsive. Who cares what goes on inside that ugly building with its ugly expanse of parking? You can always tell a Texan but you can never tell ’em much. Thanks for posting these kinds of stories, Hasso. I don’t read that local publication anymore. The Albany Dem something. Might be because for the first time in years awhile back I bought a Sunday edition. That was $4 and two minutes of my life I’ll never get back. Hasso: That zoning change came about, I’ll betcha, in early 2000s when the city mayor and council went gaga over their plans (drawn up by some consultant for a hefty fee, no doubt) created pods, or whatever they called them, where neighborhoods had centers with small convenience stores, liquor stores, too, probably…such as the neighborhood shopping (sort-of) center built by the big Sequoia trees off Waverley Drive. So, they changed the zoning to facilitate their mini-shopping centers in each neighborhood. That was when they also were going to un-fence the canal and build an expensive promenade all across Albany. You should remember that, Hasso. You were editor of the paper at the time. The City of Albany has a very nasty way of changing zoning so that existing uses are no longer conforming. Someone in Community Development thinks that they can redefine the City according to their ideals. Things like parking strips filled with construction debris that won’t grow trees, or streets so narrow two cars cannot pass. If you just go a couple blocks East, there are a group of “Mini Houses” that the City had no problem ignoring zoning restrictions regarding minimum size. I assume you mean Periwinkle Place (Periwinkle Circle, SE). I know it only through Google Street View’s 2012 photos. 1 – The often-too-large suburban house built for the “normal” (but increasingly fictional) family. Sometimes chosen by those for whom solvency is a low priority. 2 – Parking-lot-surrounded apartments like those in Hasso’s Sept. 10 article. Sometimes the refuge of those who became insolvent.